Yesterday was quite a day in our nation’s capital as we celebrated the life and leadership of George H.W. Bush, our 41st President. 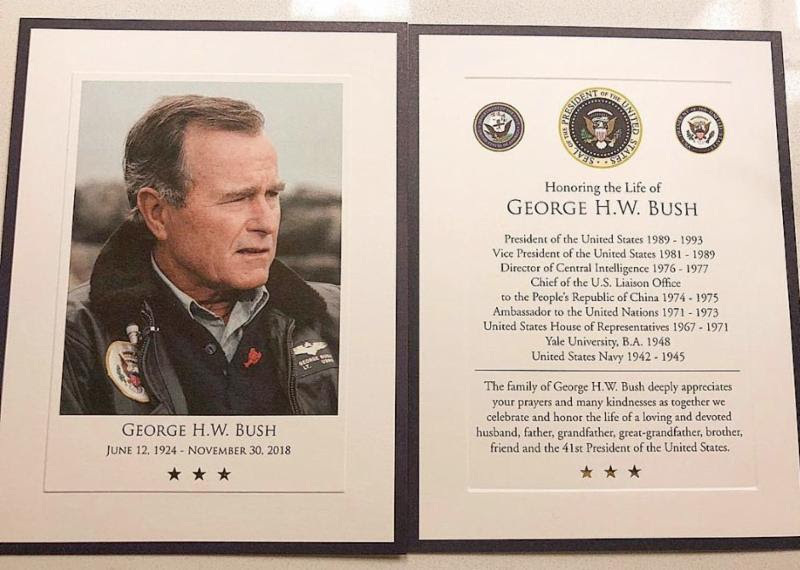 I was fortunate to be in Washington, D.C. earlier this week at a conference for small business lenders, and a couple of my friends and I got to go to the Capitol and pay our respects to President Bush, in-person. These keepsakes (front and back are pictured here) were given to visitors in the Rotunda. THANK YOU, Mr. President. Humanity is better off from your efforts. Great father, doting husband, war hero, smart statesman and patriarch of a great American family… a true role model for us all. Rest In Peace, sir. Few people come along in our brief histories here on this little piece of dirt in the universe, who make us stop and evaluate ourselves. I’d venture to say that he does and maybe you joined me in doing so yesterday. I’m challenged to be better, to do more and to care for people and serve the entrepreneurs and referral partners with whom we work in a way greater than ever before. Include Renovation Funds in your SBA 504! Fountainhead was honored to close a commercial loan last week in California for Presentation Media. This $4.2 million SBA 504 loan closed 33 days after we received the referral — yes, working with a specialist speeds the process. We were able to fold in renovation costs, so this office / warehouse facility will be completely transformed inside and out. Congratulations to our new client and our referral partner! Our Fountainhead 504 is a diverse loan program that can include everything from acquisition to ground-up construction to renovation. If you’re about to turndown a deal or don’t know where to turn to help them, don’t assume we can’t solve your “issues”… call or email me right away.